Drivers having already graduated from Jim Russell’s Performance Driving Course, or any Jim Russell Racing program or other recognized Club or Professional Driving School program are eligible for the new Performance Lapping Sessions. This program is a day of lapping, with lots of seat time, small group sizes, and the chance to challenge Canada’s premier racing circuit while receiving professional one on one feedback from our team of certified race driving instructors. 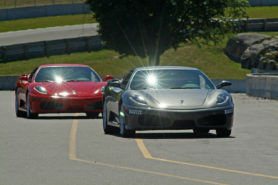 VEHICLE INSURANCE: Insurance coverage for your car (while on the track) is available with Stoneridge Specialty Insurers. Interested students can request an application with your confirmation package or visit their website at www.stoneridgespecialty.ca for more details. For students interested in obtaining a competition license, Performance Lapping Days are the final two steps of a three step process needed to receive certification for an ASN CANADA FIA affiliated regional competition license. To become eligible, drivers must successfully complete the Performance Driving Course and a minimum of two (2) Performance Lapping Days.